Simple. Win and we're legit. If we lose, all isn't lost because of Ohio State next week. But if we win...so much more meaning is thrust onto this team and this coaching staff. Suddenly, Michigan ain't so damn bad. This game is what happens when two schools with tremendously rich football histories get together for a game that has realistically no meaning to the outside world whatsoever. But to each other, it does. Why so? 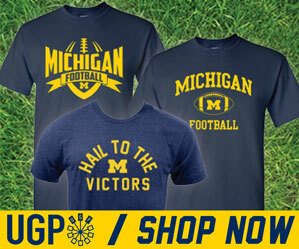 Because of 1997, of course – when Michigan was forced to share it's outright national title with Nebraska. Something Tom Osborne fought tooth and nail to make sure happened. PITCH IT TO BREASTON!!! BREASTON!!!!!!! WHERE'S THE FLAG?!?!?!??!??! Yeah, that play. I was sitting at Scorekeepers after way too many brews to be able to handle what I was seeing on the big screen when that play occurred. It's probably for the best. You gotta give Mike Tirico some credit with getting all those names right though. #amiright? Okay, this preview post is starting to get away from me. So yeah, this game. Well, Vegas likes Michigan to the tune of about 2.5 points last time I looked a couple days ago. That's basically calling this a pick 'em with home field advantage. What I hate is Michigan has lost 5 straight against ranked teams at home by an average of 16.6 points. So yeah. The truth is, Michigan and Nebraska actually match up pretty well together. Take a peak at our stats post from Wednesday. Where Michigan does have an advantage is against Nebraska's passing game. The Huskers are averaging over 22 points against per game, while Michigan is averaging just over 16. Both schools are scoring about 32 points per game so far. Where Michigan really needs to be concerned is Nebraska's running game. RB Rex Burkhead and QB Taylor Martinez are the real deal, and combined are helping Nebraska's offense average over 232 yards on the ground per game. Burkhead had a nice day at Penn State last week running for 121 yards and a touchdown. He actually has a rushing TD in every game this year. He will score on us on Saturday. "Obviously, he's a challenge to all 11 guys out there and coaches and everything else because he's a guy who runs downhill, runs hard, and he's got enough acceleration and movement to him that he's tough to tackle," Hoke said. "He's really a great slicing style of runner." As good as Coker looked against us in Iowa City two weeks ago? I don't think so. But teams to have a knack for played their best game against us. Martinez is a bit of a wild card. Much like Denard, he's a QB who liked to run first and pass second. But that doesn't mean he won't try to air it out. For a running QB, he throws a lot. His stats are very similar to Denard's this year. They key for us to contain and control with our DL and blitzing LB's. Make Martinez beat us with his arm. Mike Martin and company should be able to take care of the rest. "He is only a sophomore and he is still learning and growing and developing," Pelini said. "He is making a lot of progress and his confidence continues to grow, which is always a positive. "There is a lot he needs to learn and improve upon, but you can say that about anybody in that stage of their career." Offensively, Michigan is looking good with Fitz Toussaint at RB. Fitz had a great day last week against what I would consider one of the best defensive fronts in the league. Denard is said to be doing fine with his sprained wrist he suffered at Illinois last week which took him out of the game. No question Denard has some mechanics he needs to work on, but at times last week, especially early on, he looked really good. He looked confident and relaxed...like old happy Denard. Not the new frustrated Denard we've seen at times this year. Although I'll agree that he's still missing a gear that is keeping him from breaking away from defenders. Along the line, Michigan is looking fine with what we had at Illinois. Ricky Barnum is still out, but that's nothing new. Taylor Lewan looked fine to me last week. And any questions about David Molk were answered numerous times as well. Again, can't overstate how well we played against a good Illinois D. Getting lost in the shuffle of the game was the outstanding play of our OL. We'll need more of that this week. As far as special teams, I think we're looking much better with kickoffs. Both kick coverage and returns have improved. Coverage is better all around, and Gallon has added a nice twist to the return unit. He's looked really good. Brendon Gibbons is all of the sudden automatic with field goals. He's 8/11 so far this year afar going 1/5 last year. Thank you very much. 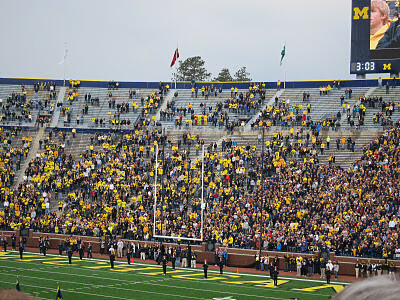 Yes, that is the Michigan student section 3 minutes prior to the Purdue game a few weeks ago. Need I remind you, we were 6-1 and ranked at the time this photo was taken. Yes it was a noon game. Yes it was after a bye-week. Yes it was following the Sparty loss. I don't care. There is no excuse for this. Students, get to the game on time. You're embarrassing yourselves. Do not let this ever happen again. I don't care if we're playing Whatchamacallit Technical College. This is Michigan! Back to my point. If the UM fans bring it like they did against Notre Dame, we'll be in the drivers seat for this game. My gut is telling me it's going to be a good game. It's going to be low scoring. There will be mistakes made by both teams. But the better of the two defenses will prevail. In that case, the clear edge goes to Michigan. • How Critical are Michigan's Next Two Games?